Brandon Juarez first walked the grounds of Grand Canyon University 15 years ago as an out-of-state student. Today, he is a full-time assistant professor and the best part about his story at GCU is that his office now sits across the hall from the professor who helped shape his future. Editor’s note: This story is reprinted from the December issue of GCU Magazine. To view the digital version of the magazine, click here. Brandon Juarez first walked the grounds of Grand Canyon University 15 years ago as an out-of-state student. Today, he walks through celebrating his first year as a full-time assistant professor. 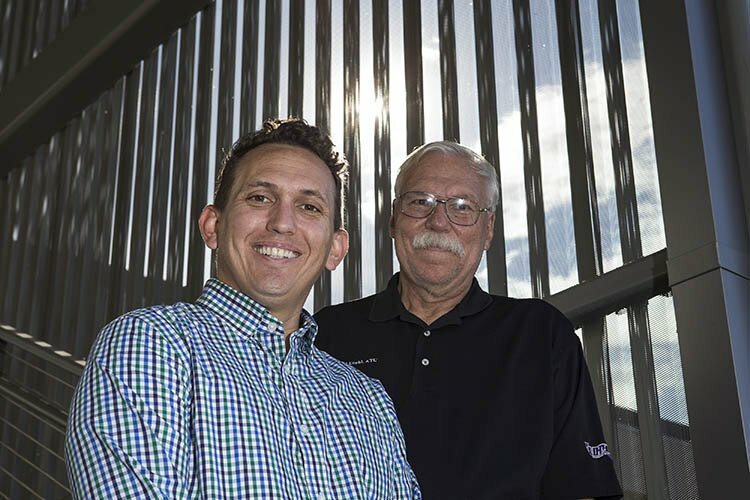 To bring things full circle, Juarez, who teaches in the College of Education, now sits across the hall from the professor who helped him decide GCU was the right place for him at a time when he was overwhelmed and scared. Juarez had just received his associate’s degree in liberal arts from Fullerton (Calif.) College. He had never lived anywhere other than Fullerton, his hometown, but that changed during the process of looking for an elite four-year university, which eventually led him to GCU. Juarez signed up for a tour of GCU, but after his visit, he found he was still on the fence. Then his tour guide caught him by surprise when he scheduled him to sit down with a professor, William Kuehl. The one-hour meeting was climactic, Juarez recalled. He shared his educational experiences and future plans, and in exchange Kuehl handed Juarez a tentative schedule and glimpse into his future at GCU. Then everything clicked. Fast forward 15 years, and Juarez still marvels at how it all evolved. “That’s the nugget really worth noting. I’m still working on my emotions, to be honest, but I knew then that I could own my education at GCU and seek support when I needed it,” he said. Kuehl, a professor and director of exercise science in the College of Science, Engineering and Technology, has experienced GCU at the forefront of change. He began his career in 1983 as an adjunct professor for the University’s first Care and Prevention of Athletic Injuries course. He added that, while teaching now includes different approaches and methods than when he was getting started, GCU’s mission and well-known slogan — “Find Your Purpose” — always have fit with his focus. As someone for whom a high school coach helped him unlock his full potential, Kuehl is passionate about bringing that philosophy to light. Kuehl didn’t set out to be a teacher, but when he was a 13-year-old benchwarmer on his high school baseball and basketball teams, a coach encouraged him to look into athletic training. After his first course, Kuehl never looked back. By age 17, he was working as a conditioning and rehabilitation trainer for the Phoenix Suns and the Los Angeles Angels of Anaheim (then the California Angels). Looking back on how far he’s come, Kuehl said he learned the true meaning of education. “I knew I was good at what I did at a very young age, and it was because I had studied all of it,” he said. Over the years, Kuehl has strived to help his students through their college degree. Juarez and Kuehl never completely left each other’s lives after that initial meeting. As a student, Juarez frequently stopped by Kuehl’s office. As a professional, he found himself transferring Kuehl’s teaching philosophies into his classroom. Juarez considers himself an introvert, and Kuehl challenged him to invest outside of himself. “You can be reserved, but then you really are missing out on one of your callings in the teaching world, which is to serve the students in your classroom,” Juarez said. “The way Bill taught made me feel at home. He didn’t sound like a teacher giving his students a lecture — there was much more of an interaction. He’s got that constant smile on his face and a genuine desire to wish people well.